How long could you do a no spend challenge for? We are 2 months into our 6 month no spend challenge. I have enjoyed it more than I thought I would despite a few obstacles along the way. The next few months will be interesting with Fathers Day, my daughters birthday, 2 trips, a long weekend family event and Christmas. I am determined though and my bank account loves me for it. 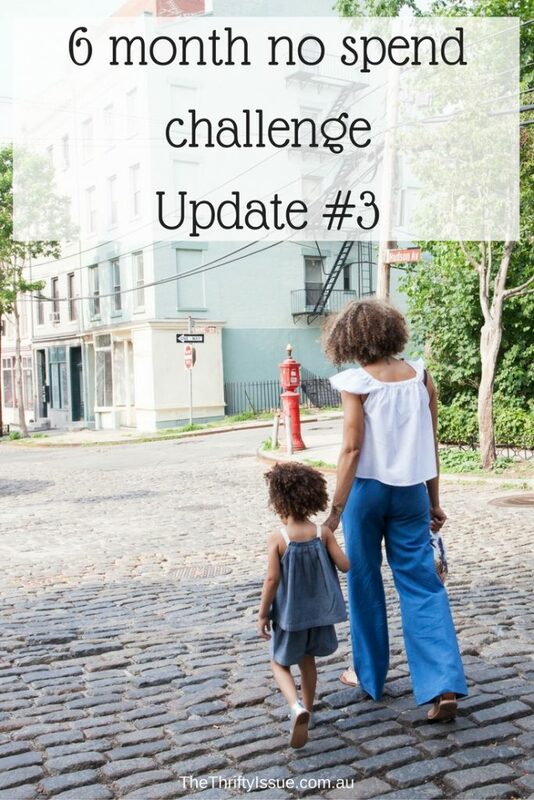 You can check out my first and second updates, plus 10 tips to stop spending. Since we live in a rented, furnished apartment it’s the landlords responsibility to fix it. Lucky for them it is under warranty. Not lucky for us, it got to room temperature quickly and we lost food. We don’t know our neighbours here to be able to store anything at theirs. We don’t have a big esky because there is no space to store anything like that here. We ate what we could. I cooked up some and some stayed frozen long enough to space out the food over the two days. Thankfully, we had not done a big shop the week before. Instead, I knew this week we need a little extra to cover toiletries we were running low on, so scaled back and used up what we had this week. We had one pre-booked in July when I started the challenge and that was within budget. I had another trip come up for the end of September which was not to be missed. I sold tickets I had for another event to pay for this one and it looks like it will lead to some amazing opportunities and ongoing work. Now, another trip in October has come up. I have an idea on how to make money from this trip so aim to turn it into a profit rather than an expense. Otherwise, the trip will be around $250 of unplanned expenses. Kids clothing was an allowable expense. I did not expect my 7yr old to go through 3 pairs of pants and two tops in a week! That kid is adventurous, spirited and constantly active. She gets expensive though! I nearly went over our budget for clothing, unfortunately (or fortunately for my budget? ), when we went shopping to replace the pants and tops for school, there was only 1 pair of leggings that fit her. She has two perfectly good school dresses she refuses to wear. Now with the option of no pants, because she was with me when they weren’t there, she has relented and is wearing her school dress. She begged me to buy this school dress I might add and it cost more than any other item of clothing she owns! She’s not short on school clothes. She used to have enough for a week, now she has enough for 3 days. We have had some illnesses, extra doctors appointments and increased spending on medication, supplements etc. These aren’t things I would include as part of a no spend challenge. It did push the budget a bit in other areas though. School activities including two school camps, 2 excursions, some ‘incursions’ and the Fathers Day breakfast set me back a total of $567. At other schools my daughters attended camps were held when the kids were older nor were there so many excursions, so I hadn’t budgeted this much into their school expenses this year, but will increase the education budget for next year. Kids parties – we had two invites for childrens parties plus my daughter has hers this month. Her party has been planned and budgeted for. The other kids parties weren’t but I am not turning down a party my kids have been invited to. They picked presents worth $20 each and I paid for my eldest daughter to attend the same farm with one of her friends when one party was on. When the other party is on my other daughter and I will be spending some time exploring the local area close by, just the two of us. Total unexpected expense here was $45 and comes out of a budget I have set aside for celebrations. I’m including it here because really, it is a discretionary expense. Despite the extra expenses, I have $800 extra tucked away since starting this challenge, plus have found a few more ways to make money. I have gotten creative with how I do things, stretched our food further, booked us in for free events in our area and planned out some future family entertainment. My daughters and I have had fun doing things together, actively exploring the area, having ‘at home day spas’ and things like that. We have a long weekend at the end of this month and originally wanted to go away somewhere, then we realised we haven’t had a weekend off where we could go do proper sightseeing since we moved here and there is so much we have been meaning to do. Also, we live in an amazing complex with a pool, spa, saunas, gyms etc. It’s like permanently living in a hotel and if you want room service, get food delivered (we won’t do that part). I did a quick 10 day fast money challenge last month and secured an extra $1,000. I also discovered a few other ways for me to make money here which I have started and should see me make around $4,000 in the next two months. I’ll explain more once they are fully in motion. We haven’t approached this with a ‘we can’t afford it’ mindset. Instead, we look at everything and think, how can we do that? Money isn’t the focus, our lifestyle is and it is surprising how many things you can do for nothing when you look at it differently and get creative. We were both already working on our health and weight. I have 10kgs of fat I am working on losing. I had a dexascan done to measure my percentage of body fat and let me tell you, those scans are no attractive! I love my body, it was interesting to see how my body holds fat, also my bone density, I am above the charts so am unlikely to ever get osteoporosis. As a result of this challenge, we have been conscious of our sleeping patterns, walking a little further than we used to, eating strictly according to our menu plan, no takeaway at all and reduced the amount of Pepsi drunk in this house. Seriously, Pepsi Max is an addiction here. My eldest daughter turns 9 this month. We sent out invitations (I designed them, then we printed them off our computer). I have a party drawer with a happy birthday sign, disposable cups, candles, cupcake cases etc. And we have been pinning things she would like at her party. It is being held at home like she wanted and will be fun, games, food etc. I have my two trips to Canberra and our family ‘staycation’ to plan in properly, make money from some of it and research all the free stuff in our area. We haven’t had enough dates for my liking lately. They don’t need to be all expensive, dinners, movies, babysitters etc. I need some one on one time with just my partner and I though. I have a great babysitter and have some other dates planned where I will be doing a childcare swap with some friends. I’ll share a list of free date ideas once we get started with it. I have a few VIP/Loyalty cards and have enough points on some of them to redeem the rewards. I usually do this in the lead up to Christmas to give me time to find presents plus reduce the groceries a little. You can check out a complete list of Australian VIP/Loyalty/Rewad programs here. I set a goal for an amount I want to make in the next 12 months and will share things I do, after I do them to make this amount. It’s more than I have ever made in a year. I don’t see any reason to wait until January first or a Monday to start a goal. I am going for it right now and will share everything I do, the highs, the lows, what made money as a stay at home mum and what was not worth it. To get you started check out the best Australian online survey sites, 10 ways to make $1,000 this month and 101 ways to make money from home. Are you doing a no spend challenge? Do you have any financial goals you want to share?